There’s no need for dedicated hardware if you choose to host your solution with us. Internal threats can pose far greater dangers to your organization than spam, viruses, network attacks and other risks originating from outside. Yet most organizations have inadequate or no protection from these internal threats. InterGuard is the solution. And it’s easy to implement and value-priced. There’s no need for dedicated hardware, or to maintain software. 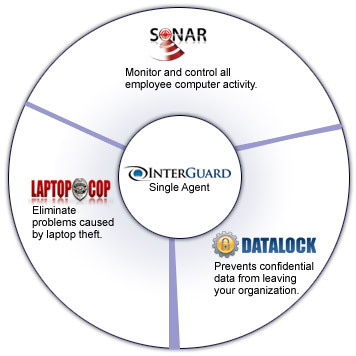 InterGuard is an on-demand, software-as-service solution. This means you manage your risks, we manage the software. We have over 100,000 users of our core on-demand solution. With InterGuard, you replace multiple pieces of software (Data Loss Prevention, Web Filtering, eForensics, Endpoint Control, Laptop Theft) and get more functionality and protection – at less than 20% of the price of buying piecemeal solutions. Result: dramatically improved ROI. Your employees are your most valuable resource. Yet they are also often the source of the most serious challenges to protecting your confidential data, increasing productivity and profitability and assuring regulatory compliance. These internal threats can be deliberate or accidental. But each has the potential to threaten financial performance, undermine your competitiveness and impact profitability. Internal threats are pervasive, cutting across all departments, functions and work flows. 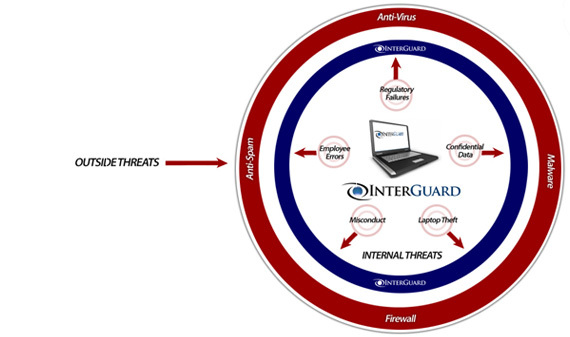 Click on each of the diagrams below to see how InterGuard’s suite of products can help you solve your internal security threats. InterGuard has a unified core architecture, built on a patented Single Desktop Agent, to provide security against the widest range of internal threats. InterGuard enables you to deploy a consistent, comprehensive level of security on every computer throughout your entire organization. Our Single Agent operates invisibly at the desktop, instead of at the network level. First, our software is easier and less expensive to implement than competitors, with far lower total cost of ownership. Second, it affords a higher level of protection against a range of business risks from the theft or loss of valuable intellectual property and customer data, losses in employee productivity, theft of company laptops, employee misconduct and regulatory compliance. InterGuard’s interoperable Single Agent reports back over standard HTTPS protocols, instead of over a network. This allows for real-time reporting of on or off-network activity and eliminates the need for dedicated hardware or complex network-level administration and integration. InterGuard is accessed and managed using a browser. 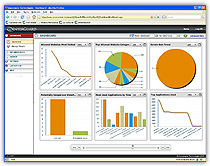 A central dashboard provides administrators with total visibility across their computer infrastructure, providing evidence of improper activity and highlighting potential weaknesses and areas of maximum vulnerability.